A thug who attacked his estranged wife and refused to leave her home after it was surrounded by police is facing time behind bars. 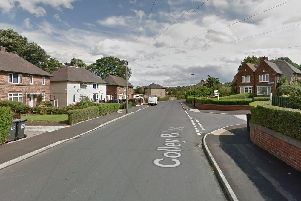 Chesterfield magistrates’ court heard on August 30 how Mark Drew, 44, of Tapton View Road, Chesterfield, kicked, bit and tried to strangle his estranged wife before she fled her home and police arrived. Prosecuting solicitor Sarah Haslam said Drew subsequently refused to leave the property and threw bottles out of the window and was allegedly brandishing a knife. Mrs Haslam said Drew threw his estranged wife to the floor, kicked her to the head and legs, bit her nose and he was trying to strangle her and she believed she was going to pass out. Drew’s estranged wife climbed out of a window at her home in Hasland, according to Mrs Haslam, and police were alerted but Drew refused to come out of the property. She added that Drew threw bottles out of the window and Mrs Haslam claimed he was seen holding a knife. Drew gave no comment in his police interview but claimed he had not been waving a knife around inside the property. The defendant pleaded guilty to committing affray after the incident on August 11. He added: “All options are open but custody is highly likely. Judge Davison adjourned the case until September 6 to consider a probation report before sentencing. Drew was released on conditional bail on the grounds he does not contact his estranged wife or visit her home.